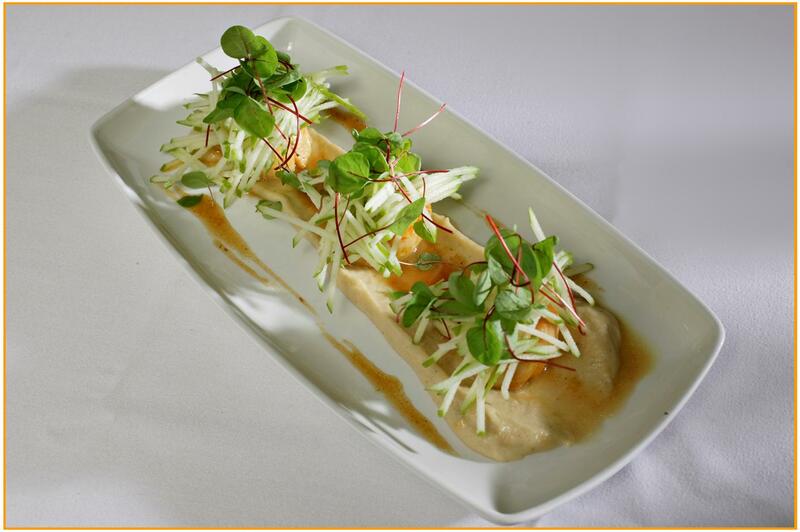 Method Start by making the parsnip puree; toast the cumin, fenugreek and coriander seeds in a pan, then add the chopped parsnip, milk & cream. Cook this mix until tender, then puree in a food processor until it is smooth and lump free. For the apple salad, just grate the apple on the coarse part of a grater, or cut into match stick sized strips. Now for the scallops; mix the curry powder with the salt and season the scallops well, heat a pan until very hot, then add a little olive oil and allow this to come up to temperature. Add the scallops and cook for just one minute each side, then remove from the heat and allow to cool a little – 2 minutes should be long enough. Add the butter and lemon juice; shake the pan to emulsify the butter with the lemon juice. Serve with a little of the pan sauce and fresh coriander sprouts. This cocktail is not shaken or stirred. Its name derives from its supposed resemblance to a sunrise in having a graduation in colour from a deep red at the base to an orange or yellow at the top. Tequila and orange juice are poured into a glass of ice. Crème de Cassis is then carefully added. Being denser, it falls to the bottom of the drink. A less alcoholic version can be made by substituting grenadine syrup for the Crème de Cassis. Serve with a Maraschino cherry on a stick. 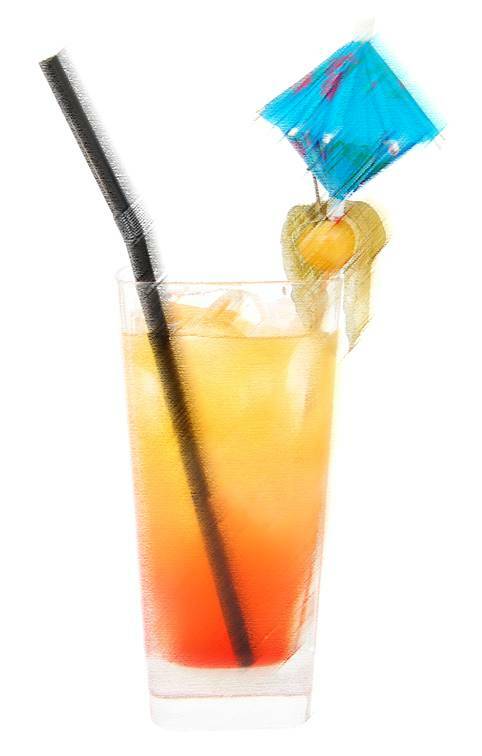 Other spirits can be used to replace the tequila and pineapple juice can be mixed with the orange juice. Why not relive the hazy summer days in Sutton Coldfield with this colourful cocktail. Some say that the French style of food is a little dated and does not belong in today’s culinary catalogue; however, there is no denying the great taste and combinations you find in many French dishes. Here is a classic peasant dish, particularly popular with the workers on the vineyards of France, also popular witth residents of Sutton Coldfield. 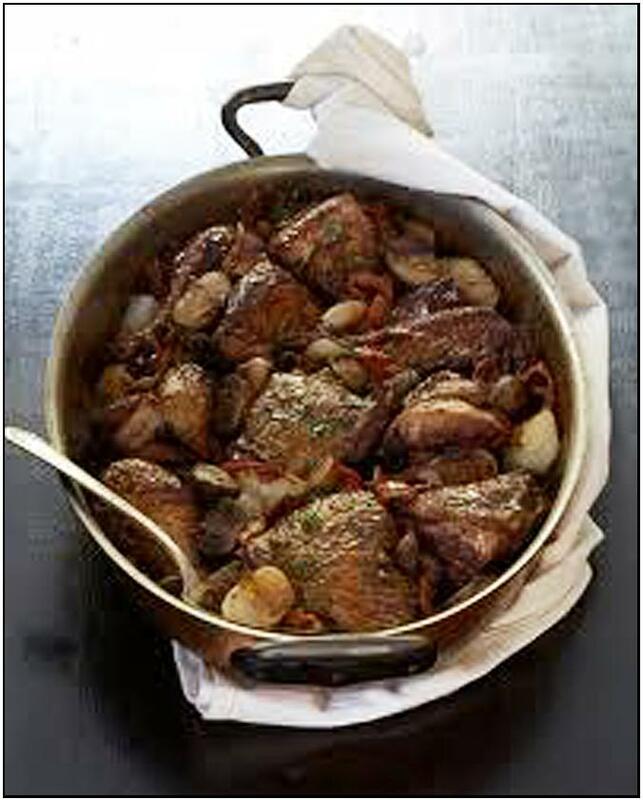 Remember the golden rule for cooking with wine: If you would not drink it, do not cook with it. 1. Heat a thick bottomed pan, add the butter and fry the shallots until browned, then add the garlic and fry for a couple of minutes. 2. Add the mushrooms and bacon, brown slightly and then pour in the wine and stock. Put in the chicken pieces and thyme, then bring to the boil and simmer for 30 minutes or until the chicken is cooked through. 3. Remove the chicken and reduce the liquid by a quarter, put the chicken back into the sauce, season and serve with sauté potatoes or crusty bread.